This is the B-Man's Guide to Golf in Charlotte and the surrounding area. 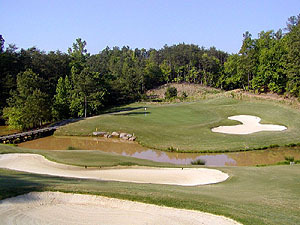 The site offers detailed course information, including full scorecards, green fees, maps, and directions. You also get course updates, like current course conditions, discounts & coupons, and tournament news. I encourage you to submit your own course ratings and reviews and comment on others, including The B-Man's. There's also a message board to exchange information related to golf around town. If you have questions or suggestions for me, please use the Feedback form. For more about me and my game, check out my Profile page. You can also follow The B-Man on , Facebook, Instagram or with the RSS feeds for the latest Course Updates, Reviews or Message Board postings. 4/8/19, Emerald Lake Golf Club, Review by nstoudt - Greens were recently aerated. Course was surprisingly soggy. But nothing too severe. 3/31/19, Carolina Lakes Golf Club, Review by nstoudt - Course was in pretty good shape. Greens were recently aerated however.